I really enjoyed this volume, though it had it’s ups and downs with me. I wasn’t that interested in the part with Yuki and the student council members. I wasn’t really sure what was going on there anyway. I’m glad someone made Yuki feel good though. After years of begin brainwashed by Akito, it was time for him to hear something good about himself. It’s also nice to see him confiding in Tohru a little more. He’s really starting to open up to her. Uo meets a guy that seems interested in her. I’m a little worried about him though. 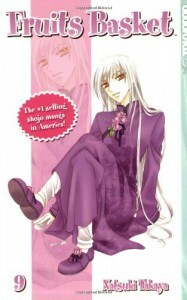 It appears he might be a Sohma. I’m not sure how much of a coincidence that can be. I’m eager to see how that will pan out. We also get a really nice look into Hana’s terrible past. She had a rough time when she was younger. Of course, Tohru and Uo helped her through it when they met. Tohru seems to just light up everyone’s life again. It’s nice that they’re all aware of how wonderful she is. I wish she was a little more aware of it. Tohru go with Kyo to visit Shishou at the dojo. Of course, they’re left alone to make lunch and flirt and laugh. This chapter is where one of my favorite drawings of them comes in. I saw that once when I was finding the cover to a previous volume and I thought it looked so tender. It isn’t often we see Kyo act this way. I really love it when he does. I can’t wait for more. Shishou is called away by Kyo’s father to discuss Kyo’s future. Let me say, I really hate Kyo’s father. I may not know the whole story of what happened to his mother, but if Shishou thinks his father shouldn’t blame Kyo, it’s probably true. I’m glad Shisou stands up for Kyo. He knows Tohru is good for him. Kyo isn’t the same angry boy he used to be, and it’s because of her. I really don’t think Kyo should have to go through the same lonely life Shishou’s grandfather had. Especially not when he has someone who loves him so much, even knowing his darkest secrets.